Brands on Facebook striving for engagement would be wise to heed the power of videos, as a recent study by Shareaholic found that post-click engagement with Facebook posts trailed far behind the results delivered by YouTube, and also lagged behind Google Plus, LinkedIn, and Twitter. 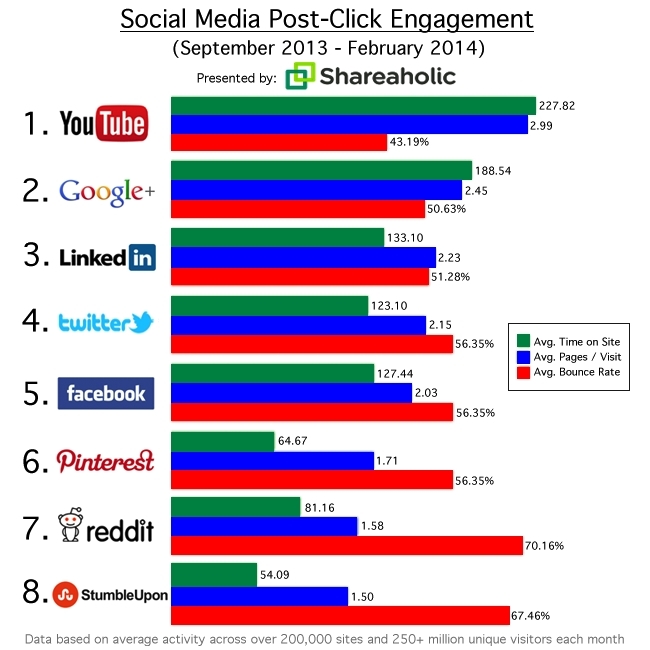 YouTube is the undisputed champion: YouTube drives the most engaged traffic. These referrals have the lowest average bounce rate (43.19 percent), the highest pages per visit (2.99), and the longest visit duration (227.82 seconds). Why are visitors from YouTube so engaged? Because video itself is so engaging, and viewers are likely to maintain a similar level of engagement with related content. Therefore, video watchers are especially receptive to links within video descriptions that complement the audio and visual content they just consumed. Another reason YouTube takes home the crown is because viewers are simply used to spending minutes — perhaps, hours — educating and entertaining themselves with awesome video and may have fewer qualms about taking extra time to discover more great content post-click. Although Google Plus and LinkedIn drive the fewest social referrals, they bring in some of the best visitors: Google Plus users, on average, find themselves spending north of three minutes diving into things shared by connections in their circles. They also visit 2.45 pages during each visit, and bounce only 50.63 percent of the time. LinkedIn users generally spend 2 minutes and 13 seconds on each link they click, viewing 2.23 pages with each visit and bouncing 51.28 percent of the time. Although many sites see minimal traffic from both Google Plus and LinkedIn, now may be the time to invest in building communities within those networks if engagement really matters to your business. A referral from Twitter is as good as a referral from Facebook — at least, in terms of bounce rate, pages per visit, and time on site: Tied in fourth place are Twitter and Facebook. Both types of visitors bounce the same (56.35 percent of the time), while Twitter wins the pages per visit category (2.15 vs 2.03), and Facebook users tend to spend more time on a site post-click than Twitter users do (127.44 seconds vs. 123.10). Pinterest isn’t exactly the social media golden child we all play it up to be: Coming in sixth, pinners bounce as often as Facebook users and tweeps do, but view fewer pages per visit (1.71), and they spend considerably less time on site (64.67 seconds) than almost all of its counterparts, with the exception of StumbleUpon. Reddit users are the most fickle: Redditors are the most likely to abandon sites — on average, 70.16 percent bounce. For marketers, Reddit is a tough nut to crack. Its uber-loyal users are increasingly selective about the content that gets upvoted and are eager to downvote things they disagree with. Effectively, Reddit hates marketing. In the past, I’ve even encouraged site owners to quit Reddit. Naturally, I applaud (and envy) brands and businesses that do it right. An excellent example that comes to mind is Newegg’s involvement on /r/buildapc (h/t AGeezus). Readers: Did any of the results from Shareaholic surprise you?